Nutone Existing home inlet kit includes all necessary hardware with 330NIV inlet and 8-Inch Superflex tubing. This kit comes with CF329 mounting plate, inlet frame and tubing guard for extra user convenience. It is suitable for installation of a central vacuum system after completion of home construction. 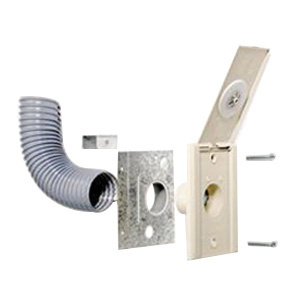 This kit is ideal for tight areas where straight tubing to wall inlets connection is difficult.